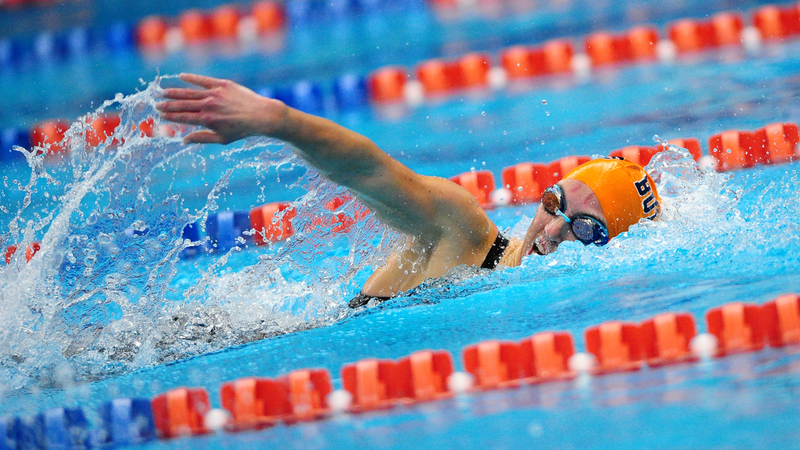 Women’s Swimming Comes Up Just Short, Takes Second | The Gettysburgian. The Gettysburg women’s swimming team hosted a two-day invitational last weekend. Two conference foes: Dickinson, and Bryn Mawr, as well as Susquehanna and Mary Washington competed at the Gettysburg College Invitational. The first day of the invitational was highlighted by first-year Megan Wojnar’s performance in the 200-yard backstroke. Wojnar ’22 finished with a time of 2:06.91, edging Lynne Cassidy ‘92’s record by .3 seconds. Cassidy captured 25 All-American awards throughout her career, so to break one of her records in her first season as a Bullet puts Wojnar on an enviable trajectory. Another winner on the day was first-year Katie Cooper ’22, who won the 200-breaststroke in 2:23.44, the second fastest time in school history. Junior Kate Crilly ‘20 also took a victory in the 100-freestyle. The Bullets also had several second-place finishers on the day which was huge towards winning the team points battle. Lindsay Hayden ’19 took second in the 100-free with a personal best of 53.72. Katie Jenkins ’22 finished second in the 200-fly in 2:08.45, just off the school record by .23 seconds. In addition, Katherine Sears ’21 was edged in the last lap but still took second in the 1650-freestyle. The Bullets also worked well together on the relay as they were runners up in the 200-medley and the 400-free relays. A couple of third-place finishes added to the Bullets point total with senior Maggie Morehouse ’19 finishing third in the 1650-free, and sophomore Sydney Jaramillo ‘21 taking third in the 200-fly. The second day of competition proved to be a great one for the Bullets. They battled point for point with the University of Mary Washington before settling in second, 4 points back at the end of a long invitational. Despite the close loss there were many bright spots for the Bullets. The team set the school record in the 800-free relay. The team made up of Hayden ’19, Cooper ’22, Wojnar ’22, and Crilly ’20 finished in 7:52.47. The same Bullets quartet also won the 200-free relay, with first-year Cate Kosko ’22 replacing Wojnar, and Hayden bringing the team home in 1:38.94. Wojnar ‘22 was busy in the individual events, winning both the 400-IM and the 500-freestyle. Cooper ’22 also won an event, taking the 100-breast stroke, and finishing second in the 50-free. Jenkins ’22 snagged two runner up finishes in the 100-fly and the 100-breast stroke. Krilly ’20, Morehouse ’19, and Sears ’21 finished in second, third, and fourth respectively in the 200-freestyle, providing necessary points in the close team battle. Despite a huge day in the relays, the Bullets were edged for the invitational victory by the slimmest of margins, 1,015 – 1,011. However, as the season continues, the young team, with plenty of veteran leadership will continue to look to make improvements as the year progresses.